Today I finally visited Blue Springs — 22 years in Florida, and I finally made it the 45 minutes up the road to see — what’s the description? — the most productive? the most watery? . . . well the spring that gushes forth the most water each day in Florida: something like 100 million gallons. And it is a quiet place! After walking the 1/3 mile boardwalk to the head of the spring, there was the pool. Still and silent — until you begin to see the subtle ripples on the surface that betray the fact that millions of gallons of water each hour are pouring forth from the cavern at the pool’s center. 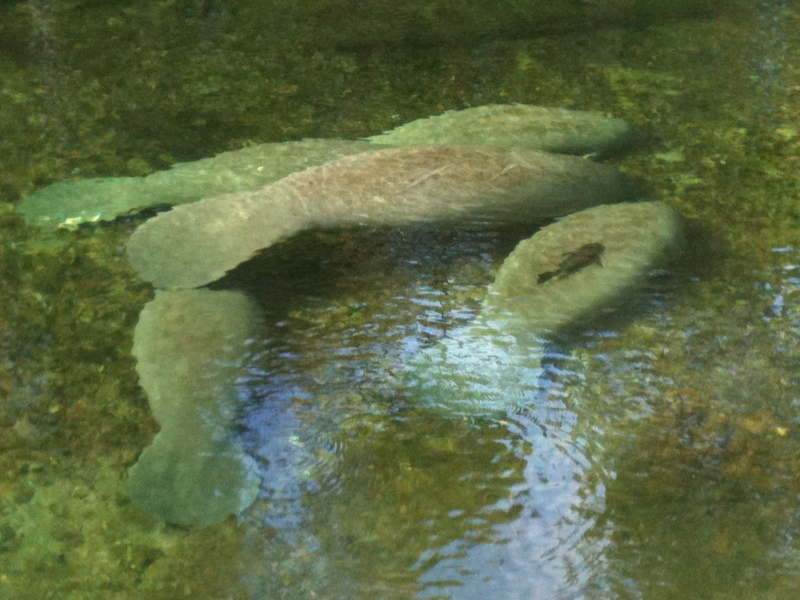 And this time of year, there are the gentle giants — the manatees. Today’s manatee count: more than 120. We saw several dozen, some right below us. It is refreshing and salutary, to study the poise and quietness of Christ. His task and responsibility might well have driven a man out of his mind. But He was never in a hurry, never impressed by numbers, never a slave of the clock. He was acting, He said, as He observed God to act—never in a hurry (pages 55, 56). Indeed. I need to slow down — praying this Christmas season will be a time to slow down, find quiet, rest, relax, rejuvenate, and renew. Hoping the same for you as well. How sad! Especially at a time of year when we prepare to celebrate the incarnation of the Creator, how sad to read such nihilistic naturalism. In an otherwise informative and even inspiring article, I find it rather sad that Mr. Krauss closed by so patronizingly dismissing 3000 years of Western cultural belief as so much solipsistic obscurantism. But if, as he implies, we come from nothing and are destined for nothing more than utter oblivion, then the concept that we are lucky to be living on this cosmic speck is an idea which has both feet firmly planted in the nothingness of outer space. Of course, one could say much more, but the art of the letter is brevity. As sophisticated as one’s language may become — Mr. Krauss is publishing a new book entitled A Universe from Nothing — when the premise rests upon nothing, then it is only so much nonsensical noise. I agree with the sages through history who have rightly said that if there was ever a time when there was nothing, then there would still be nothing. For anything to exist, Something must have the power of being in itself. When God disclosed Himself as “I AM” He was saying “I Am the One who causes all things to be.” And Paul echoed this idea in Colossians when he said, “For by him all things were created, in heaven and on earth, visible and invisible, whether thrones or dominions or rulers or authorities—all things were created through him and for him. And he is before all things, and in him all things hold together” (Col. 1:16-17). At this Advent season, I refuse to listen to those with nothing to say. Rather, I will hear the One who says, “Be still and know that I am God”!